…and what does this mean for the design of wearable electronic textiles? I have been working in the textile and fashion industry for over 20 years and have specialised in design for sustainability since 2007. My desire to figure out how I could become a ‘sustainable’ designer had grown stronger over the years and I decided to go back to university to explore the meaning of sustainability in the context of my own commercial design practice as a freelance sportswear and fashion designer. Following the completion of my MA in Design for Textile Futures at Central Saint Martins in London, and having developed a growing understanding of sustainable design, I felt well-equipped to take my knowledge back into industry to contribute to much-needed change. However, I quickly realised that our understanding of sustainability continuously evolves in response to new findings, emerging innovations and changing consumer behaviour, and that trying to come up with one single working definition of sustainability is pretty impossible. Saying that, I have always found it helpful to think of Sustainability through the concept of the ‘triple bottom line’ or the three Ps: people (social aspects), planet (environmental aspects) and profits (economic aspects). This implies that as a general guiding principle ‘Sustainable Design’ needs to consider, maximise and protect the benefits of the three Ps. For textile and clothing designers this means that on top of working within particular budgets and price points in mind to make a project or design economically viable, we need to be aware of the social and environmental impact of any materials, components and colouration and manufacturing methods we utilise, as well as considering how our products are used, cared for and disposed of at end-of-life. Considering the environmental and social impact of our design decisions is essential, as every choice we make during the conceptual and design stages, has a significant effect on the social and environmental footprint of a product. This becomes particularly important when designing e-textiles and textile-based wearable technology, as the creation of these types of products requires a diverse range of additional materials and components compared to regular textiles and clothing. Not only do we need to think of sourcing low-impact and renewable textile substrates, we also have to consider the impact of utilising precious metals, which are needed to produce conductive and electronic elements. 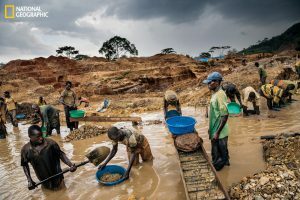 In addition to the environmental impact and potential resource depletion, we need consider serious social and ethical aspects as the working conditions men, women and children have to endure to harvest precious minerals are often unacceptable. In addition, there could be health implications for wearers of e-textiles, especially when these are worn next to the skin. Although research on health impacts is still patchy, there are many stakeholders concerned about issues around electromagnetic radiation exposure, battery proximity to the body and effects of signals from wireless communication, as well as exposure to hazardous chemicals in the heavy metals, plastics and ceramics used to produce consumer electronics and batteries. It seems like pioneering and developing more sustainable approaches for the design of e-textiles and textile-based wearable technology is incredibly difficult but I am hopeful that as designers we can rise to the challenge and start by focusing on particular issues and problems that need to be solved. 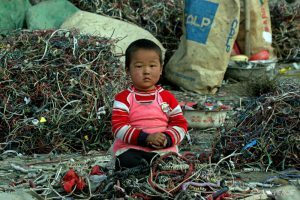 One of the most obvious challenges in this field is the product’s end-of-life as we are already struggling with mountains of electronic waste from consumer products and textile waste from the fashion industry. 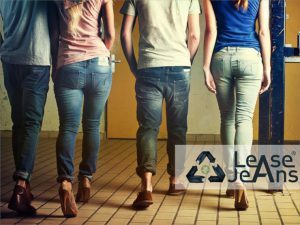 By embedding electronics into textiles, clothing, accessories and footwear, when these are often invisible, we are making this situation much worse by creating hybrid products, which are incredibly difficult to identify and recycle. However, as creative thinkers and makers, we do have the opportunity to ‘design out waste’ by exploring particular design strategies as part of our practice. Approaches for designing out waste include a) the design of products that have a long life and are repairable, b) design for disassembly and recycling and c) design for composting/ biodegradability. 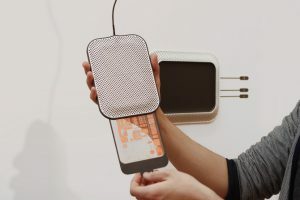 Having talked to Hannah and Mika from Kobakant about their environmental sustainability motivations in great detail, it soon became apparent that they are extremely passionate about creating objects and products that sit within a framework of ‘longevity and repairability’. This approach fits in very well with their recently launched E-Textile Tailor Shop KOBA Massschneiderei, where they design, develop and make e-textile and wearable technology objects to order. Design for durability & longevity is a multi-faceted and effective strategy to encourage the wearer to keep a product for longer, repair or upgrade it when needed, or pass it on to someone else when they no longer want to wear it. Ideally, this way the product will never end up in landfill, as it will remain in active use for a long period of time, or has enough value in its raw materials, so that these can be recycled should repair no longer be an option. The longevity of a product is determined by two major factors, physical and emotional durability; while physical durability refers to the product’s ability to resist damage and wear, emotional durability means that a product continues to be relevant and desirable to the wearer. Designers can take practical steps to enhance physical durability and these include choosing durable fabrics and components, as well as prolonging life through appropriate colouration and finishing technologies and product construction, such as reinforced seams. 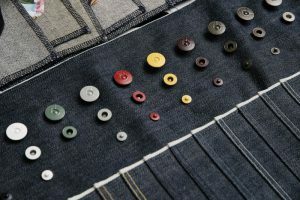 In order to encourage emotional durability, designers can consciously choose classic styling, or create multi-functional objects, which are versatile or adaptable, so they can be worn in different ways and for different occasions. Another great way to create a longer-lasting bond between the wearer and the object is to involve them into the design and creation of the piece, this can range from simple customisation (choosing fabrics, colours and trims) to more sophisticated bespoke services including individual fit and one-off designs. In order to enable product longevity, designers can also engage with the wearer during the use-phase, this includes advice on wash and care, as well as offering a repair and alteration service, provide a space where customers can learn how to repair the pieces themselves or provide them with self-repair instructions. In the case of wearable technology, it will also be important to consider the possibility of upgrading the integrated technology components of a product, so it does not become obsolete, when the enabling technology is no longer viable. Equally, there must be relatively easy access to any of those components, in case they need to be repaired or replaced. If the wearer really does not want to keep the piece, the designer can also help them with passing it on to someone else by selling it as a ‘preloved’ item, or take the item back to be re-designed and given a second life. Also interesting is the approach of sharing or rental, as we are already seeing various business models where the brand/ the designer remains the ‘owner’ of the piece, so they can take full responsibility for its use, reuse and recycling at end-of-life if required. 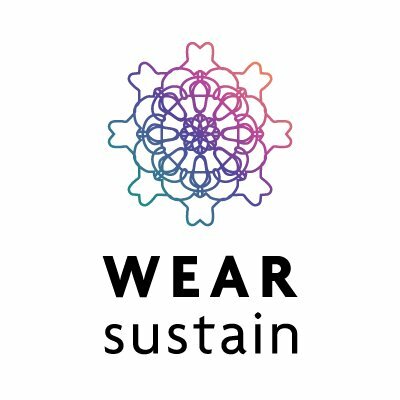 So in response to the question ‘what is sustainability…and what does it mean for the design of wearable e-textiles?’, there really is no one-size-fits-all definition. 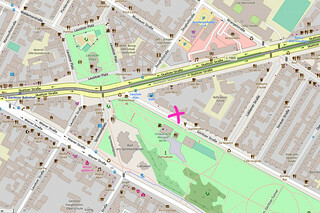 In my opinion designers and makers need to explore their understanding of what sustainability means to them, in the context of their objects and products, as well as their individual social and environmental concerns and unique motivations for wanting to embed sustainable design principles into their practice. In addition, I feel very strongly that any commercial wearable technology products must fulfill a ‘real user need’, rather than simply utilising a technology for the sake or the fun of it. The overall questions to asks ourselves should be: ‘do we really need this product/ object?’, ‘how will it make the user’s life any better?’ and ‘do we really need electronics in this product?’, otherwise, we are just flooding the market with meaningless and often very short-lived products that will be left in a drawer or thrown away. I am very excited to see where this journey into sustainability leads Mika and Hannah and their bespoke e-textile and wearable technology creations in the future.